Stuff is made of atoms, tiny particles that are too small to see. We can infer the existence of atoms from the chemical properties of matter, in particular how elements combine to form other substances. For many common compounds, the elements combine in specific fixed ratios, which can be understood as the combination of specific numbers of atoms of each element into molecules. This much we've discussed already. 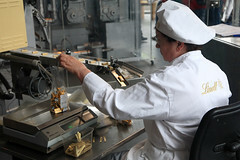 Careful weighing of gold (wrapping with chocolate inside). Historically, the next step in the exploration of the elements was a painstaking process of experiment that took place in the first half of the 19th century. John Dalton had formulated his atomic theory around 1803. He backed it up with experiments in which he tried to determine not only the ratios with which atoms combined, but also, by carefully weighing the samples of elements and compounds before and after reactions, what the relative weights of the atoms must be. As an example, take water, which has the chemical formula H2O. A molecule of water is made of two atoms of hydrogen combined with one atom of oxygen. An experiment might start by taking a jar of hydrogen and a jar of oxygen, and weighing them very carefully to determine the weights of the gases inside. If you then combine and ignite the mixture, you produce as much water as the elements can make, leaving behind any leftover hydrogen or oxygen. You can then weigh the amount of water produced and any leftover gas, and figure out what weight of hydrogen and what weight of oxygen form the same weight of the compound water. If you do this accurately, you discover that water is made up of eight times the weight of oxygen as the weight of hydrogen. Since this represents twice as many hydrogen atoms as it does oxygen atoms, you can conclude that a single atom of oxygen weighs 16 times as much as an atom of hydrogen. In reality, Dalton's experiments were a bit messier. His equipment wasn't quite up to the necessary precision, and he made the mistake of assuming that water was made of equal numbers of hydrogen and oxygen atoms. You can figure out the correct ratio by comparing the ratios among a number of different compounds using different elements, but it took the later work of the Italian chemist Amadeo Avogadro to really nail that down properly. As a result, Dalton's list of atomic weights (the relative weights of single atoms of different elements) were a bit screwy. But he was on the right track, and laid the important groundwork for what was to follow. 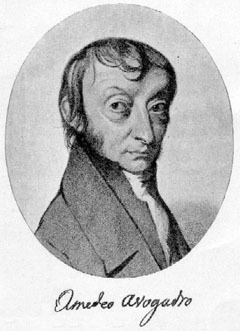 Amadeo Avogadro. Public domain image from Wikimedia Commons. Avogadro sorted this out properly, also establishing that gases like hydrogen, nitrogen, and oxygen are in fact made of molecules containing two atoms each of the respective elements. This, and better precision in experiment, led to much more accurate measurements of the relative weights of the atoms. Another thing Avogadro had in his favour was his discovery of what has since become known as Avogadro's law: that equal volumes of gas at the same temperature and pressure contain the same number of molecules (not atoms), regardless of what the gas is. This made it much easier to measure the amounts of gases, rather than trying to weigh jars of gas. Using this observation, Avogadro measured the atomic weights of several elements. And then the chemists working on this problem began to notice a very curious thing. One thing you might notice about these numbers is that they are almost all whole numbers. The various point-ones and point-nines are so close to whole numbers that you might be tempted to call them measurement errors and say that, as a rule, atoms have weights that are exact whole number multiples of the weight of hydrogen. That is in fact what the chemists of the early 19th century did, formulating this as a scientific hypothesis. The hope was that this regularity of atomic weights might reveal something deeper and more fundamental about the nature of atoms and elements. The other thing you might notice from these measurements is that the weights of atoms of different elements are all different. It didn't necessarily have to be that way, as far as anyone at the time knew. An atom of oxygen could have been exactly the same weight as an atom of carbon, or in fact all atoms could have been the same weight! But when they did the measurements, they found they were all different. This led to another hypothesis: that the different chemical properties of elements are in fact caused, somehow, by the weights of their atoms. Atoms have weights that are whole number multiples of the weight of a hydrogen atom. The weights of atoms determine the properties of the element made of those atoms. The next step in science is to test your hypotheses by making more measurements and observations. One of these hypotheses would turn out to be wrong, and very quickly. But that's okay - that's how science works. And as we discovered much later, the reasons why it was wrong are extremely interesting and led to fascinating new discoveries. So even though the hypothesis was wrong, it was a valuable stepping stone for future knowledge to come. And to relieve the suspense, it was the first hypothesis that turned out to be incorrect. When chemists measured chlorine (a greenish gas identified as an element in 1810 by Humphry Davy), they got an atomic weight of 35.5 times hydrogen. At first many of them thought this was a mistake: surely it must be 35 or 36 exactly, and there was some error with the measurements. But despite ever more careful experiments, the number remained stubbornly at 35.5. So, reluctantly, the chemists had to give up their idea that atoms had nice whole number weights. 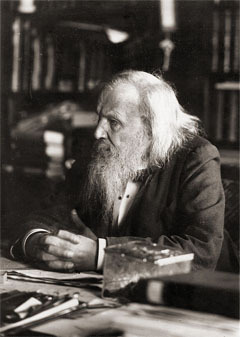 Dmitri Mendeleev, photographed in 1897. Public domain image from Wikimedia Commons. An element with properties like boron, with atomic weight around 44. An element with properties like aluminium, with atomic weight around 68. An element with properties like silicon, with atomic weight around 72. An element with properties like manganese, with atomic weight around 100. In 1875, a mere 5 years later, Paul Emile Lecoq de Boisbaudran discovered and isolated the new element gallium. Its properties matched Mendeleev's predictions for an aluminium-like element reasonably well, and its atomic weight was 70. Another 4 years later, in 1879, Lars Fredrik Nilson discovered the new element scandium, with atomic weight 45 and matching Medeleev's boron-like prediction. And then in 1886 came the confirmation that really cemented Mendeleev's importance: the discovery of a silicon-like element which was christened germanium, atomic weight 72.6, and with properties that were astoundingly close to Mendeleev's predictions. 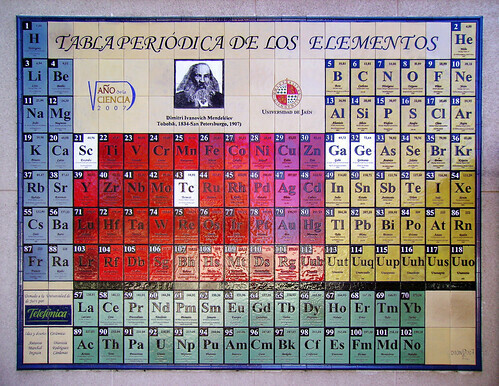 From then on, the periodic table of elements became a standard fixture of chemical knowledge and understanding. There were however still some gaps in the table. Mendeleev had made some other predictions later, and they ended up being filled in too, but not until after he died in 1907. The elements protactinium and hafnium filled gaps, but it wasn't until 1936 that Carlo Perrier and Emilio Segrè managed to find the manganese-like element technetium, atomic weight 98. For 66 years the hole in Mendeleev's table had taunted chemists and physicists, but now it had finally been plugged, fully justifying the periodic table as a useful tool that reflects physical reality. In 1997, the International Union of Pure and Applied Chemistry ratified the name of mendelevium, ensuring it would be used forever to refer to this element. Why are the atomic weights of many of the elements so tantalisingly close to whole number multiples of the weight of a hydrogen atom? 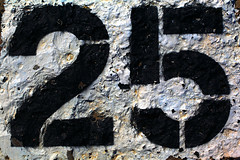 More accurate measurements showed that some of them (carbon, nitrogen, oxygen, fluorine, sodium) are whole numbers to two or three decimal places! And why are a few of them not close at all? The pattern looks far too neat to be a coincidence, especially for the lighter elements, and at the same time is broken by a few elements that just seem completely random. What is going on here? Why are the chemical properties of the elements related to the weights of their atoms? The periodic table is a stunning piece of ordering and classifying of natural objects that works brilliantly. But what's behind it? Why does it work? What is it telling us about the nature of atoms? The answers to these two questions turn out to involve something altogether surprising. Hydrogen is lighter than air, but it still has a positive weight (air just has a greater weight). You can determine it by weighing a jar with nothing in it (a vacuum), and then the same jar with hydrogen in it, which will be heavier. Now known to generations of high school chemistry students as the guy who gave us Avogadro's number. I'm being a bit loose here with the distinction between "weight" and "mass". Really, I'm using "weight" mostly because it's a more familiar word for most people. If you prefer to read it as "mass", that's okay. The difference between these two concepts is not really important at the moment, but will come up in later annotations when I talk about things like force and gravity. Last Modified: Tuesday, 25 March 2014; 15:09:23 PST.